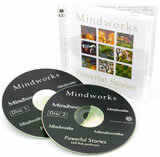 STORIES have always been used to soothe troubled minds, illustrate new possibilities and simplify complex explanations. In children they delight, entertain and educate and in adults they can enhance creativity, aid learning and facilitate problem solving. Regardless of who your listener is, the right tale at the right time rises above the criticisms and arguments of the conscious mind to settle gently among the fertile fields of the unconscious mind, where it can germinate and grow new options, ideas and understandings. You will enjoy Rob�s use of traditional instruments, his many voices and consummate storytelling ability. Listen to learn, or simply allow yourself to be carried away into Rob�s fantastic worlds.